Donald Trump is a successful real-estate mogul who has achieved celebrity status and been in the national spotlight for nearly 30 years. He has hinted in past election cycles he might run for president, and he announced his campaign for the 2016 Republican nomination in June 2015. Trump took a significant inheritance and, through a combination of business acumen and extreme self-promotion, turned it into a fortune that typically makes the Forbes 400 list of wealthiest Americans. His name has become a brand identified with luxury and extravagance. Between his business dealings, his hosting of a television reality show, and a personal life that has been featured in tabloids for several decades, Trump is among the most recognized people in America. Trump has identified with the Republican Party for many years, although his political giving has been bipartisan in nature. He has made securing the border and opposing illegal immigration a cornerstone of his campaign, and he favors significant tax reform as well. His views on foreign policy are consistent with a non-interventionist viewpoint, and he opposed the Iraq invasion. Trump’s campaign was initially considered to be a long shot, although since his June announcement he has polled well, leading the field in nearly every poll in recent months. His bombastic and confrontational speaking style (he routinely insults opponents and critics) has drawn many admirers looking for an alternative to the often stale and politically calibrated statements of most politicians, although it has also generated significant controversy. Trump has led the polls since shortly after entering the race and has established himself as the clear frontrunner after finishing second in Iowa and winning New Hampshire, South Carolina, and Nevada by wide margins. He won seven of 11 of the Super Tuesday states, finishing in second place in three others, and has continued to win most of the contests since then, including Michigan, Florida, Illinois and North Carolina. He is currently leading the delegate race for the GOP nomination by a comfortable margin. He still faces strong opposition from many GOP leaders, and his candidacy could be damaged by the many Republican voters who say they would never consider supporting him. Although he is the delegate leader, it is possible and even likely that he will not be able to win a majority on the first ballot at a contested convention, and subsequent ballots may see his support drop sharply. He has high personal negatives that cause many to question his electability. But Trump has managed to exceed nearly everybody’s expectations throughout the campaign, and his success to date has established him as the leading contender for the GOP nomination. Trump has also expressed criticism if the Federal Reserve banking system. He has accused them of “creating phony numbers” and has said that it should “absolutely” be audited. In his 2000 book, The America We Deserve, Trump criticized the 3% of GDP level of funding for the military as “too low,” adding “Defense spending in the last year of the Carter administration came to 4.9% of GDP. During the Reagan buildup it was 6.5%.” He also criticized the sequestration cuts to military spending, and pledged a large buildup of the military under his presidency, although he did not specify details. He did not appear to know that the U.S. strategic nuclear arsenal has three separate components (bombers, land-based missiles, and submarine-based missiles) when the subject was raised at the December 2015 GOP debate. Trump has spoken hawkishly on the war on terror. He pledged “nobody would be tougher” than him in dealing with ISIS, promising that he would “hit them so hard and so fast that they wouldn’t know what happened.” He asserted that he has a plan to defeat ISIS, but won’t yet reveal the details of the plan. He also said he would “take out their families,” referring to killing the families of ISIS terrorists, reiterating his support for such a policy during the December 2015 GOP debate. He recommended against the U.S. becoming involved in the conflict in Syria, saying, “Wouldn’t you think maybe it’s time to stay out of one of these?” He has also recommended letting ISIS destroy Syrian President Bashar al-Assad, then going in to Syria and taking out ISIS there. He initially said the U.S. should take in some Syrian refugees without specifying how many, but he has since reversed himself over concerns terrorists could infiltrate the refugees and come to the United States. He pledged to deport any Syrian refugees who arrive in the U.S. during President Obama’s term, and he also suggested “safe zones” in Syria might be the best option for refugees. Trump has been critical of the Iraq War. He has said he “would have never been in Iraq,” and has said “those who supported the Iraq War are ‘unqualified’ to be commander-in-chief.” But in 2011 he suggested U.S. troops should remain in Iraq and “take the oil” as compensation for American lives lost and funds spent on the war. He has made similar statements regarding seizing Libya’s oil and bombing Iraqi oil fields held by ISIS to deprive the terrorist group of revenue. In late October 2015, Trump said the world would be better off if both Saddam Hussein and Moammar Gadhafi were still in power instead of having been forcibly deposed by the U.S. and allies, and although he has said recently he did not favor U.S. intervention in Libya, his 2011 comments on the subject clearly indicate he supported the Obama administration’s actions in helping to overthrow the dictator. He also favored “a slightly longer waiting period to purchase a gun,” and it’s unclear if he has shifted his position on this issue. He said he would consider a ban on gun purchases by those on government terrorist watch lists, something opposed by most gun-rights advocates because the lists are often inaccurate and violate due-process rights. From a long public life as a celebrity, businessman and TV star, Trump has many vulnerabilities stemming from controversial statements and actions throughout his public life. Trump was a leading figure in the emergence of the “birther” movement, which questioned whether Obama was a natural-born citizen and thus whether he was eligible to be president. Trump has been quoted as saying that there’s “a very big chance” Obama was born outside of the U.S. and lied about being born in Kenya to get into college. He has also speculated that Obama won’t release the birth certificate because, “there is something on that birth certificate — maybe religion, maybe it says he’s a Muslim, I don’t know. Maybe he doesn’t want that. Or, he may not have one.” He reiterated his uncertainty over Obama’s birthplace as recently as July 2015. Trump has suggested that vaccines are a cause of autism, despite there being no scientific support for this theory. In 2009 he publicly endorsed a nutritional supplement and testing company that had re-branded itself through a licensing deal as the Trump Network. The products sold by the company are, according to nutritional experts, of dubious value, and the health claims made by the company don’t hold up under scientific scrutiny. Trump has also been accused of racism in business practices and making racist comments. In 1973, he was sued by the Justice Department for racial discrimination, when it alleged that his New York real estate company had discriminated against several black renters. Former President of Trump Hotel & Casino John R. O’Donnell claimed in a book that Trump said to him, “[L]aziness is a trait in blacks” and “Black guys counting my money! I hate it. The only kind of people I want counting my money are short guys that wear yarmulkes every day.” Trump has denied the charges, saying O’Donnell was a disgruntled employee. His decision to renege on a commitment to pay for the medical treatment of his nephew’s son, born with cerebral palsy, as part of a dispute regarding his father’s will is likely to be used against him on the campaign trail. His companies have often faced financial trouble, with four of Trump’s business entities having filed for bankruptcy protection during his career. He also defaulted on loans made to Trump Airlines in the late 1980s. He has failed to release his tax returns despite promising repeatedly he would do so, saying that frequent IRS audits prevent him from being able to reveal them. Trump has also faced scrutiny and criticism over Trump University, a company offering high-priced real-estate investment seminars. Multiple lawsuits have been filed by participants and government attorneys, and it appears many of the promises made in promotional material were false. It has been called a “bait and switch … scam” by the New York attorney general. Trump lacks the discipline most candidates have in terms of avoiding controversial statements, such as his comments regarding Mexican illegal immigrants being “rapists.” On the one hand his admirers are drawn to his unvarnished speaking style, but it also can repel many voters, particularly those who count themselves as members of groups targeted by Trump’s incendiary comments. 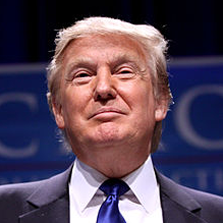 One of the key themes of Trump’s campaign has been opposition to illegal immigration and protecting U.S. workers from foreign competitors, but his own use of illegal immigrants in the construction of the Trump Tower and hiring foreign employees to come to the U.S. under a visa program for temporary workers may be used against him. Trump has been consistently vague on a large number of policy topics – declining to offer specific proposals or ideas, using euphemistic language that has little real meaning, or getting key details wrong. For example, he has said allowing Medicare to directly negotiate prescription drug prices would save $300 billion per year, when that is more than the entire country spends on drugs each year. He also said he would send “cease and desist” letters to China and Mexico to tell them to stop “ripping off” the U.S., even though that phrase has no real meaning. To date, his unwillingness or inability to delve into policy details has not been a problem for him, but at some point voters may expect more information or a better grasp of policy details.